The Clay Mathematics Institute (CMI) was incorporated in 1998 by Mr Landon T. Clay. Its establishment grew out Landon Clay's belief in the value of mathematical knowledge and its centrality to human progress, culture, and intellectual life. Landon Clay, a graduate of Harvard College, had a distinguished career as a successful businessman and in finance and science-based venture capital funding. He also devoted a great deal of thought and energy to philanthropic causes, from archaelogy and astronomy to biology and mathematics. He believed that science and mathematics have made enormous contributions to mankind's welfare and understanding of the world, and that the role of mathematics will grow ever more important in the future. The primary objective of CMI is to encourage the increase and dissemination of mathematical knowledge. The photograph was taken at the Opening Event of the CMI at MIT on 10 May, 1999. 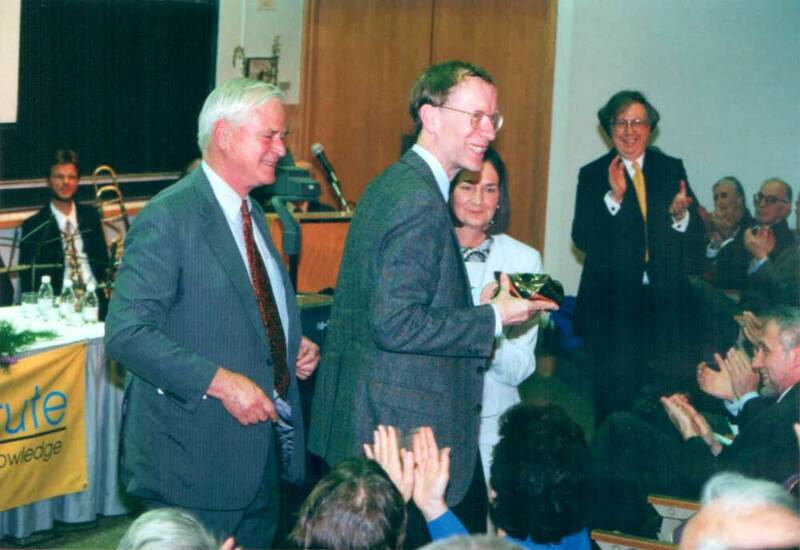 It shows Landon and Lavinia Clay with Andrew Wiles. The first president, Arthur Jaffe, is in the background. CMI may be best known for the seven Millennium Prize Problems announced at the Collège de France in Paris in June of 2000. The prizes were established by CMI to (i) recognize some of the arguably most difficult problems with which mathematicians were struggling at the turn of the millennium, (ii) to underline the importance of working on the really hard problems, and (iii) to spread the news that in mathematics hard, significant problems still abound - the frontiers of knowledge are still wide open. The Millennium Prize Problems constitute but one of CMI's activities. Two of the largest, in terms of both budget and importance, are the Clay Research Fellowships and the Clay Research Conference and Workshops, the latter being the venue at which the Clay Research Awards are presented. One or more Clay Research Fellows are selected each year by CMI's scientific advisory board for a term of two to five years. Fellows are generously supported on a twelve month basis, and may carry out their work at any institution or combination of their choice. Fellows are not restricted by nationality or country of residence. Through its Enhancement and Partnership Program, CMI runs events in partnership with other organisations or to enhance activities that are already planned, particularly by funding international participation. From time to time CMI undertakes special projects to disseminate mathematics. Notable are its digitization and film projects. In 2005, CMI, in collaboration with Octavo.com and the Bodleian Library at Oxford University, produced a digital copy of the oldest extant copy of Euclid's Elements, dating from 888 AD, when it was copied in Constantinople from a earlier manuscript. The original, written in Alexandria around 350 BC, is of course long lost. An edition of the digital copy, featuring a proposition-by-proposition index, is available in the Publications section of the website. Other digitization projects include (a) the manuscript of Riemann's 1859 paper on the distribution of prime numbers in which the Riemann hypothesis is stated, (b) the complete Klein Protokolle, Felix Klein's seminar in Goettingen from 1872 to 1912, (c) Dan Quillen's notebooks, and (d) the correspondence between Ada Lovelace and Augustus De Morgan.